The market town of Haslach is situated in the north of Austria close to the German and Czech borders. The hills of the Mühlviertel [literally: district of the mills] has been renowned for growing flax and making linen since the Middle Ages. Haslach had always played an important role in the region as its markets were known far and wide attracting merchants and weavers from near and far who bought and sold goods and brought influences from outside. Even though the town was small, it had always been liberal-minded. In the course of industrialisation the formerly domestic production transferred to the factory. Most of the 25 weaving mills in Haslach were small or medium-sized. The only exception was Messrs. Vonwiller, a large enterprise which employed hundreds of people and had a considerable influence on the economic, social and cultural life of Haslach. The company was well known and its products were exported to many countries all over the world even before 1900. Amazing sample books of luxurious jacquard weaves which are now kept in the archives of the Textile Centre Haslach bear witness to the high quality of the fabrics produced then. Built on a promontory rock the architectonically interesting factory complex has been dominating the appearance of Haslach for almost 200 years, and as an identity-establishing landmark has been a symbol for the erstwhile importance of weaving in the town. When after many highs and lows the formerly so renowned Vonwiller textile factory had to close down in 1999, the municipality of Haslach saw itself confronted with an industrial ruin in the middle of the town, now being a symbol of the decline of the once flourishing textile production of the Mühlviertel. Thanks to some dedicated regional politicians, visionary creative people and architects in the town the property could be purchased, and from 2002 onwards substantially revitalised and put to new uses with the help of funds from the EU and the provincial government. In the course of these developments a second factory building in the immediate vicinity could also be purchased and incorporated into the new concept. Today there are more people employed in the entire complex than immediately before the closing-down of Messrs. Vonwiller. The extensive area is home to various welfare, cultural and educational institutions, enterprises, halls for events, a restaurant, and since 2012 the Textile Centre Haslach. The cornerstone for the formation of the Textile Centre Haslach was the decision to move the local Museum of Weaving which had been founded in the 1970s to the historical Vonwiller factory buildings. The contents of the old museum had impressively documented local textile history with many interesting exhibits. But in the course of time the museum had aged and its appearance was no longer up-to-date. As part of the relocation the museum was to have an entirely new concept and trace an arc to the presence. To this purpose a team of textile artists, artists, architects, retired weavers, sponsors and politicians in charge was formed; there was also a cooperation with the textile department of Linz University of the Arts. When the team started its work it soon became clear that nobody wanted to “just” relocate the museum to the Vonwiller building, but that other institutions working in the textile field in Haslach wanted to be included into the overall concept. During a trip to innovative museums in Germany and Holland a joint vision began to emerge, and gradually it became apparent that there an abundance of textile treasures hidden in our own town. This was how the vision of the Textile Centre of Haslach uniting several institutions with different textile focusses under one roof came into being. The basic idea of the Textile Centre Haslach is to bring together history and presence of textile activity in the Mühlviertel. Apart from the local Museum of Weaving, small production enterprises, cultural associations, possibilities for courses and training were to be united in order to carry on spinning the thread of the textile tradition of the Mühlviertel. A network of five partners was created, who presented themselves jointly to the public as the Textile Centre Haslach, a place where a broad variety of textile themes could be experienced by the visitors. Multiple synergies arise between the partners thus counteracting the general tendency of an exodus of textile culture. 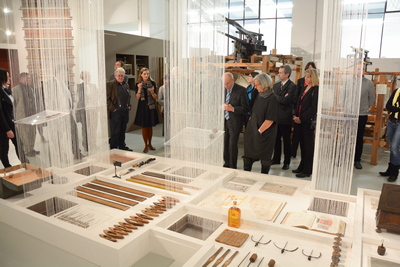 • The newly designed Museum of Weaving forms the heart of the Textile Centre Haslach for visitors of the house. It explains the traditional process of preparing the flax as well as the development from hand loom to Jacquard machine. In the “treasure chamber” visitors can delve into a wealth of colours and patterns and try their hand on many things. A large textile archive containing a collection of historical sample books which is important beyond the region as a source of inspiration for students, artists and researchers. • The Manufaktur Haslach is a socio-economic enterprise where various felted products, yarns and fabrics are made from the wool produced by regional sheep farmers. In the course of a guided tour through the house the production can be visited and the actual steps of making fabric are demonstrated on running machines. This enterprise provides temporary workplaces for people who need help in finding back into the labour market. 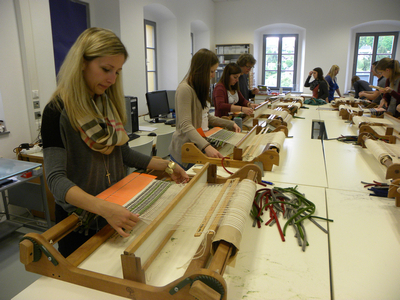 • Each year for more than 20 years the cultural assocciation Textile Kultur Haslach has been organising a Textile Symposium with courses, exhibitions of textile art, weavers’ markets, lectures, etc. which is well known internationally in the art and craft scene. There are rooms for workshops and areas for special exhibitions available in the Textile Centre Haslach, and the international connections are felt all over the house. • When the Textile College at Haslach had to close down, modern power looms from its training workshops were obtained for the Textile Centre Haslach. Within the scope of the 2012 newly established University course “Shuttle” students can now develop their own weaves, and work on the interface between art, design and machine production. • The looms from the former textile college are also used by the Weberie, which produces small series of fabrics and products for the in-house shop, and also takes commissions for metre lengths of exclusive weaves from artists, architects or fashion labels. The individual partners pool the textile forces at Haslach, cross-fertilize each other, exchange competences and refer visitors and customers to each other. However, eight years elapsed until this structure actually began to work and became a reality after being a vague vision. The important key for the success of the project was the strong identification of the persons involved, who worked with their own hands and with a high degree of responsibility, and who were always certain that life would return to these spaces with their great textile history. Today Haslach is proud again to be a weavers’ town, a fact which was quite unthinkable a few years ago.